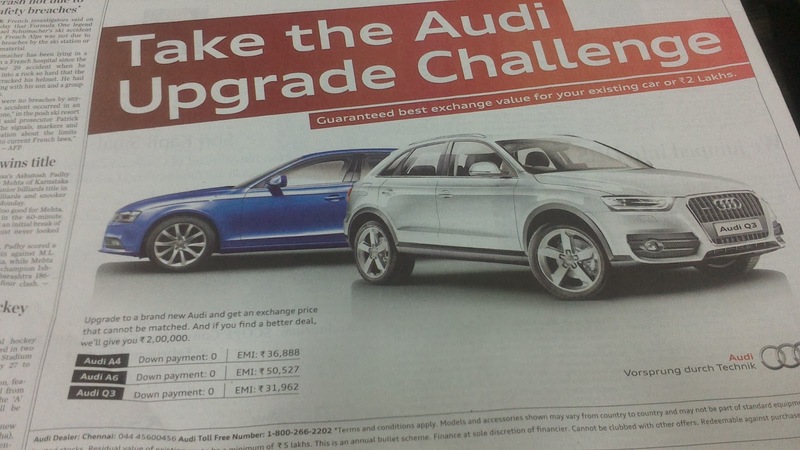 This morning, few colleagues in office noticed the Audi ad in 'The Hindu' and were surprised. If your current car is worth Rs 5 lakhs, you could drive home a Q3, if you are capable of paying an EMI of 32k. It looked like one could own a Q3 for about 25 lakh rupees (5 lakh from existing car and an EMI of 32 k, usually loans will be for 5 years). On road price of Q3 ranges between 31 to 40 lakhs. So obviously something was amiss. As usual, I was entrusted with the task of finding out what the catch is in this ad. I spoke to the audi helpline and uncovered below information. This post is to help you understand the true mathematics involved behind a well crafted and deceiving advertisement. By definition, EMI stands for equated monthly installment or total payment divided by No of months. This helps buyer identify if he can afford to set aside this much money every month. E in EMI is called 'Equated' for a reason. However, above scheme from Audi Finance is deceiving. It is not equated. Audi has a scheme called Annual Bullet. In Annual bullet scheme, customer pays X rupees for 11 months in an year and about 6X rupees on the 12th month. In above example, you have to pay 32k every month for 11 months in an year and on 12th month, you have to pay 1.8 lakhs. Thus the true EMI comes to 45k per month. But clever schemes like above lure people under false impression that they will be paying just 32k per month. To avoid giving false hopes, Audi should call above installments as UMI or unequal monthly installments. Above numbers are for the cheapest variant of Q3, the heavily stripped down S variant which has on road price of 31 lakhs. The duration of the loan is 7 years. Hence total payment will be about 37.3 lakhs+ 5 lakhs value of existing car. Numbers will vary based on resale value of your car and variant of new car you'll be buying. What next? 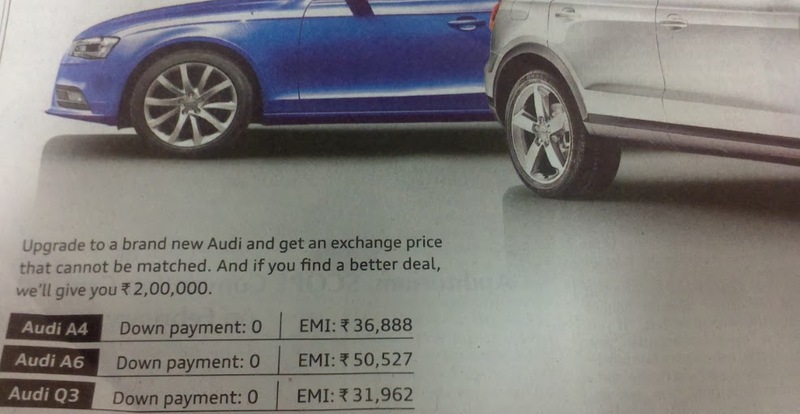 May be Audi will next launch a quarterly bullet scheme, advertising that you've to pay an EMI of only 10k per month, while hiding that every 3rd month customer has to pay 1.2 lakhs. Anyhow, just be careful of the aspects the ad doesn't speak about.